Benchmark is proud to announce that PennDOT has issued the necessary Highway Occupancy Permits for the Old Saucon Mixed Use Development in Upper Saucon Township. The project consists of a mix of residential and commercial uses and is located on Route 378 at the intersection with Center Valley Parkway. Project owner, John Blair, indicated that construction will begin with a first phase of single family residential units which will gain access from Saucon Valley Road. The second phase will consist of the commercial portion of the project which will build a driveway opposite Center Valley Road at its intersection with Route 378. The project includes an internal roundabout, walking paths, and a mix of commercial buildings. Benchmark performed the traffic studies and roadway design for the project. The project was complicated by the slow economic conditions and changing PennDOT requirements for the improvements. PennDOT issued the permits with conditions relating to the phasing of the development and the phasing of the construction of improvements. The segment/offset sign tabulation has been required on the plans and as a printed copy since the start of the implementation of the ePermitting system. This tabulation identifies all of the signs, their legends, and their locations within the limits of work. Benchmark has prepared this information in an Excel spreadsheet since the start of ePermitting so this does not create much of an additional burden for applications. Form CS-4401 relates to the details of the construction of handicap ramps within the project. This form is useful for the construction inspector to check that the ramps have been properly constructed. Prior to receiving this new request in January 2013, Benchmark prepared this form only as part of a request for technical infeasibility for the ramp to meet all the ADA requirements. 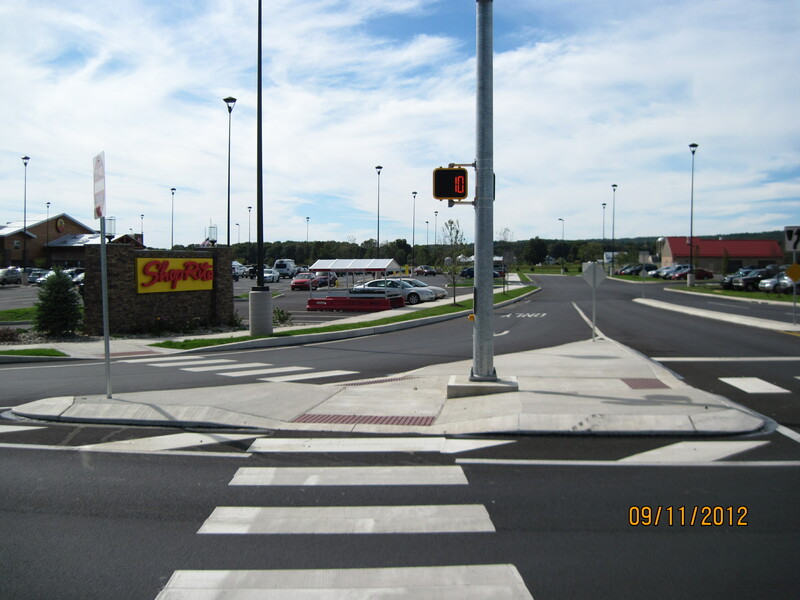 This occurs frequently when the existing grades adjacent to ADA ramps do not fall within the ADA slope requirements. Frequently most, but not all of the slope requirements can be satisfied. Providing this information for every handicap ramp on a project will increase the amount of work required to make a complete submission. The RMS Pavement Data form creates historical documentation of the pavement constructed at a site. Currently Benchmark requests the pavement history from the PennDOT Archive Office and displays it in a detail on the plans. Completing the new form requires the pavement information to be added to this form along with any new proposed pavement. This can create a significant burden depending on the number of different pavement sections within the limits of the proposed project. Providing this information along with the plans for a highway occupancy permit does not guarentee that the pavement will be constructed since some projects are permitted but never constructed and sometime the final construction differs from what is indicated on the plans to address field conditions. These three additional requirements may not seem like a lot to ask but it increases the time and effort required to prepare and get highway occupancy permits approved.